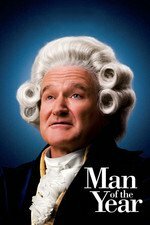 The film reunites Robin Williams and Barry Levinson (writer/director), who previously worked together on Toys and Good Morning, Vietnam. It's a promising ticket, filled out by some of the others running on it: Laura Linney, Lewis Black, Christopher Walken, and Jeff Goldblum. The film promises to be a comedy and political thriller with a romantic subplot, and most pundits voted that it failed to achieve any of the key planks in its platform. Ty Burr, Boston Globe: "'Man of the Year' becomes a small, sort-of love story surrounded by a lugubrious conspiracy drama, which in turn is surrounded by the dispersing gases of a parable that could have hurt us where we live." Stephanie Zacharek, Salon: "It’s a comedy, a political thriller, a love story: Barry Levinson’s “Man of the Year” tries to be all things to all people and fails on every count — a little like the generic, ineffectual politicians it’s pretending to excoriate." Moira McDonald, The Seattle Times: "Not so very long ago, Levinson made the terrific political satire "Wag the Dog," but it's hard to believe this is the same filmmaker. The potentially lively Williams seems muzzled for most of the film; Linney and Walken's talents are wasted. The only character who resonates is Jeff Goldblum's debonairly evil corporate lawyer, who tells Eleanor in tones oily as tinned sardines, "The perception of legitimacy is more important than legitimacy itself."" Mick LaSalle, SFGate: "Those expecting a penetrating satire from Barry Levinson, along the lines of his "Wag the Dog" (1997), may be disappointed by "Man of the Year," in which a comedian becomes president through a voting machine error. The movie touches on many of the currents and anxieties of the day, but its touch is gentle, even careful, and the story makes promises it doesn't quite deliver on. " In terms of the voting public, Man of the Year was #3 on its opening weekend (behind "The Grudge 2" and "The Departed") and then dropped to #7 before sinking further. Overall, it grossed $37M domestic. Damn it. Sorry I dropped the ball on this one. Hey, no worries - I got back from holidays and didn't even think to double-check the organizational thread and just put this together. In terms of the movie, I remember being completely underwhelmed and disappointed. I had hoped for something really biting and sarcastic and pointed; instead it was largely jokes I had heard/seen before being recycled and then a bizarre departure into a conspiracy film. I really wish that the movie had the courage to just go nuts with the premise - a comedian who has skewered the system for years gets elected and then has to deal with the realities of being in office. I think it could have been both funny and a pointed look at both the system and us (the voting public) in terms of what we expect and how we understand the system.